I’ve mentioned in previous posts that my husband, Larry, and I waited quite a while to settle down and have a family. He was 43 years old when our first son, Henry, was born and just a month shy of turning 46 when the twins, George and Charlie, were born. Despite being what some would call an “older” dad, he was a very active and fantastic dad! His purpose in life changed from the moment he held Henry in his arms. And he was just as thrilled when George and Charlie were born, telling everyone he had his own foursome for golf! Taking care of three kids under 3 years of age was tough. 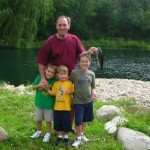 But Larry worked from home and would “pop” in and talk, play, eat lunch and lend a hand with the boys throughout the day. As the boys got older he enjoyed introducing them to the world of sports. He helped coach little league baseball, he took them to the driving range to teach them how to swing a golf club (and promptly told me to get them lessons!) and he loved to share stories about his favorite Chicago teams: he was a HUGE Cubs, Bears and Hawks fan! In addition to team sports, Larry loved the outdoors and enjoyed golfing, bike riding, hiking and fishing, which he wanted to pass on to the boys. We spent many lazy weekend afternoons riding the beautiful bike trail by our house that parallels a golf course and a city park. This same park has a small lake that’s stocked with fish at certain times of the year. 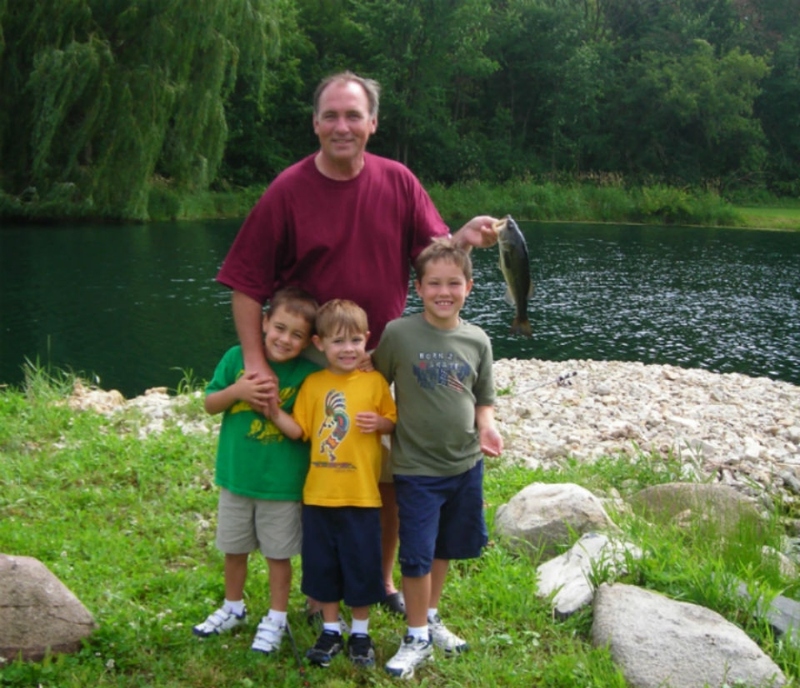 On days that Larry wanted to take the boys fishing he would first spend some time organizing the tackle box and fixing the reels on all the fishing poles, then run to the store to get fresh worms for bait. I was invited along mostly to help keep tabs on the boys! No matter how many times we went fishing, the scenario was the same. 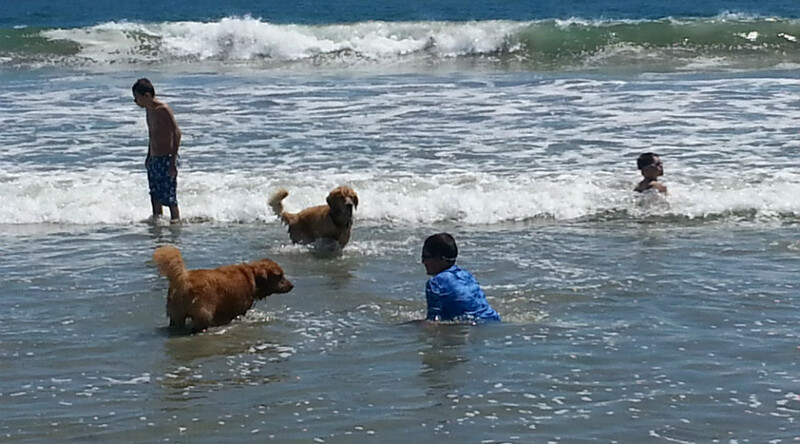 It started with the initial excitement with regards to how many fish would be caught. Everyone’s high hopes would fade quickly as one by one the boys would get their lines tangled or their fishing reels jammed. I’d have to hide my smirk as Larry’s frustration grew. It seemed just as he finished getting one fishing pole ready to be cast, another’s needed to be fixed. Needless to say, we never caught very many fish! But I gave him credit: no matter how trying the excursion may have been, he’d start planning another trip shortly thereafter. These memories are priceless. 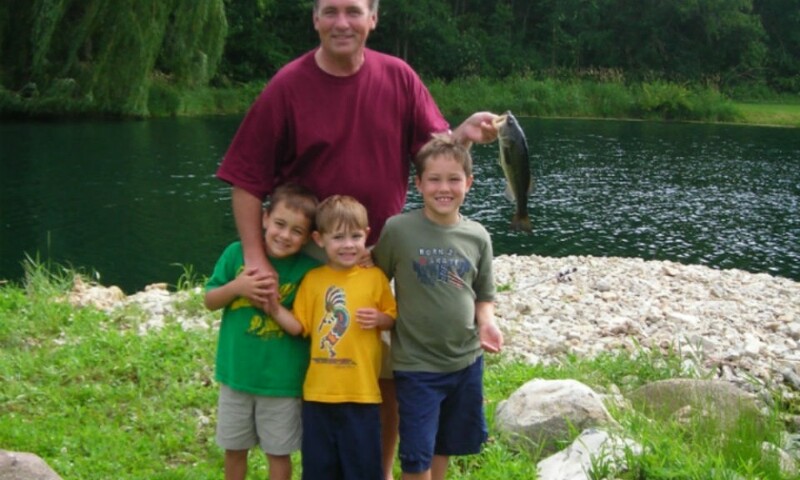 To this day the boys reminisce about the fishing they did with their dad. It’s those memories and countless others that keep Larry alive in our hearts and minds. Still, we miss him every day and regardless of how long he’s been gone it’s still difficult facing special days without him. Father’s Day is one of them. In fact, the first Father’s Day without Larry was absolutely heartbreaking. That year my own father was thousands of miles away. This was before he moved to Arizona, so spending the day with him was not an option. I look back on that as a mixed blessing. I love my father very much and certainly called to wish him a Happy Father’s Day, but that year I didn’t feel much like celebrating. It wasn’t my father I was mourning- it was my children’s dad. So I knew I had to ask my children what they wanted to do that first Father’s Day without their dad. I felt a little relieved. Selfishly I thought, “Great, I can go watch a funny movie and forget what day it is.” Then the movie started. Basically Mr. Popper (Jim Carrey) inherits a bunch of penguins after his father dies while on an expedition and ships the penguins to his residence in New York City. There were plenty of funny antics throughout the movie, but intertwined with the story was the lead character trying to reconcile a strained relationship with his dad, especially since he was no longer alive. “Are you kidding me?? !” I wanted to scream in the theater. I came here to avoid all thoughts of death, particularly grief for fathers who died, and this is what I get. And that’s when I realized, when it comes to death, there is no escaping grief. You can run, you can hide, you can even pretend for a brief moment the unthinkable didn’t happen… But the reality is: it did. This Sunday I know there will be many of us wondering how we’re going to spend the day. What do you do on Father’s Day if your own father is no longer alive? And the unthinkable: how do you cope if you’re a father who has lost a child? I wrote the following tips in an earlier post for Mother’s Day, but I found they are just as valuable today as they were then. * They can write a letter or draw a picture for their dad. * Are there any other male figures they would like to recognize on this day? A grandfather, uncle or close friend? You’re enduring the pain of watching your adult son grieve for your grandchild while you yourself are also grieving. Because you love your child (who is no longer a child), you will do what most fathers do and give the biggest gift of all: your love, understanding and patience. The biggest gift you give – your unconditional love – will be returned to you tenfold because of your patience and understanding. As for me and the boys… I’m very thankful that my father is living close by. I won’t take a Father’s Day for granted ever again. The boys and I will spend some time honoring their dad and our continued love for him and we will also spend time with my dad, their grandfather, and let him know how happy we are he is still with us. I pray all the dads find peace in their hearts this Father’s Day. P.S. To all the dads out there, I wish you a very happy Father’s Day! The weather is warming up across the United States (especially in Arizona, yikes!) 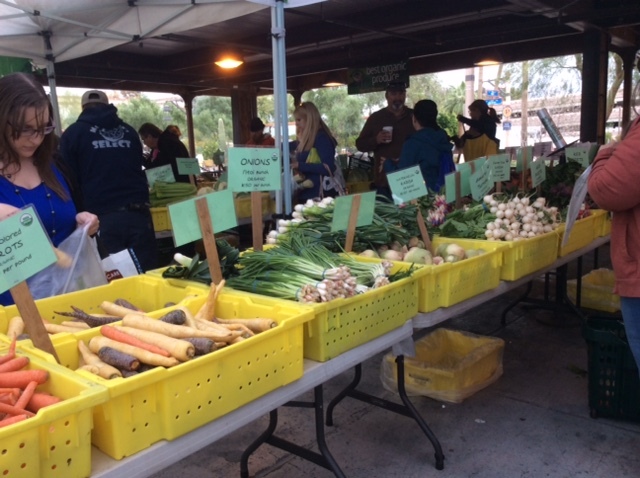 and it tends to bring farmers out into the community to offer their fresh local produce for patrons to purchase. The higher temps and (hopefully) sunny days also entice many individuals to start their own home vegetable gardens. 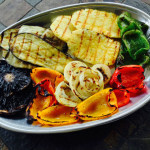 Even the pickiest or most adverse “anti-vegetables” individuals will soften when they get their hands on a home-grown tomato, cucumber or bell pepper. Nothing tastes better than vegetables picked fresh from the garden and brought to the table that same day – or that same hour! I can’t think of a better time of year to discuss the benefits of eating a diet rich in plants. Now, don’t get nervous… I’ve stated before: I’m not trying to “convert” anyone to only following a plant-based diet! I AM trying to get you to eat more plants, though, and hopefully after reading today’s post you’ll understand that all I want is for you and me to be the healthiest we can be. We all know that we need to eat a diet that consists of protein, fat and carbohydrates along with essential vitamins and minerals in order for our bodies to survive. But, have you ever heard of phytochemicals? I find it fascinating that it wasn’t until the 19th century when scientists even discovered the essential components that make up our food. I mean, how did the human race exist without carefully measuring how much protein, fat or carbs they ate each day? Of course, I’m kidding around! But what’s not funny is today we live in a society that is spending billions (yes, BILLIONS) of dollars a year trying to figure out how to lose weight or be healthy by subscribing to every fad diet and buying products that promise everything under the sun to change your life… if only you buy their product! Ironically, as a nation, we are getting heavier and our health is declining faster. Plant foods can have a dramatic impact on your health because of the phytochemicals (also known as phytonutrients) that they contain. These phytonutrients are bioactive compounds found in plants we eat. They are said to be the plants’ protective mechanism for fighting off pests and predators, free radicals, pollution, toxins and ultraviolet rays (imagine what they can do for your body!) Plants are truly amazing and have existed on this planet for millions of years WITHOUT the need of pesticides to ward off bugs. Mother Nature created plants to be resilient and beneficial to the animal kingdom- and that includes us humans! The phytonutrients in the plants are also responsible for the color, smell and taste of the fruits, vegetables, legumes, grains, nuts and seeds we eat. So why don’t we hear about phytonutrients as much as we do proteins, fats, carbs, vitamins and minerals? First, science has just recently begun to understand the benefits phytonutrients can have on our health- discoveries as recent as the 1980’s have unveiled the benefits of phytonutrients. Second, since phytonutrients are not essential nutrients that our bodies need to survive like protein, fat and carbs, in my opinion, they don’t get the respect they deserve. Yet, scholars from centuries ago already knew what our scientists are discovering now. The main difference is the historians didn’t have names for phytonutrients like we do today. Scientists from around the world are finally discovering and naming individual phytonutrients (more than 25,000 so far) and providing studies that connect specific health benefits to each one. In fact, phytonutrients and their benefits date back to Chinese medicine which has used plants for medicinal purposes for 5,000 years. Even Hippocrates, the father of medicine, understood the high value plant food had for our bodies. I’m sure most of you know he was the originator of the Hippocratic Oath our medical doctors recite today before they start to practice medicine. But what you may not know is that Hippocrates was a staunch advocate for eating a mostly plant-based diet. He even went so far as to insinuate food could be the best medicine we have available to us. His quote- “Let food be thy medicine and medicine be thy food” – has been repeated on almost every website and social media forum that discusses health. So while phytonutrients may not be essential for our bodies to survive, I think it’s fair to suggest they are essential to the healthy state our bodies should maintain. The list of phytonutrients and their benefits is long, but I’m sure there are a few you may already be familiar with. Have you heard of flavonoids? Flavonoids have been shown to have anti-cancer, anti-oxidant, anti-allergenic, anti-inflammatory and anti-viral properties. What foods have flavonoids? A few examples would be parsley, blueberries, black tea, citrus, wine (yippee! ), cocoa and legumes. There’s so much information about phytonutrients and their health benefits I could write a book (lightbulb moment!) but in this post I’m just going to highlight a few that have caught my attention. Being a single mom and facing grief in my life has put quite a bit of stress on my body and I’m convinced I have some free radical damage to my cells (also because I suffer from chronic inflammation, an indicator of free radical damage). So I was particularly happy to see the phytonutrient carotenoids is good at removing free radicals from the cells. I was even happier when I realized I already eat a great deal of the foods listed as containing carotenoids such as carrots, dark leafy greens and tomatoes. Being a woman isoflavones caught my attention with their ability to modulate estrogen levels, thus reducing the risk of breast cancer and heart disease. Isoflavones are abundantly found in soy. I know all you soy skeptics are groaning right about now, mostly because there has been so much negative publicity about soy. This issue warrants a separate post! With a few members in my family suffering from high cholesterol (how about you?) 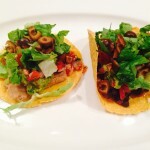 I’m happy to share the benefits of eating foods high in saponins, such as legumes and alfalfa. 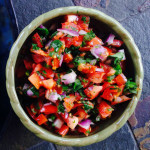 In my house we love and eat lots of tomatoes, raw and cooked, which supplies us with the phytonutrient lycopene, which has been linked to fighting heart disease and prostate cancer. I’ve been cooking with onions and garlic for years, all the while having no idea I was getting the phytonutrient allicin, which is known for eliminating toxins from the body. With so many phytonutrients which plants are the best ones to eat? If you recall from earlier in the post, the phytochemicals found in plants are responsible for the color of the plant, each one offering a different health benefit. This is why it’s recommended to… Eat a RAINBOW of plant foods! If you eat a variety of plant foods daily you can only increase your health. As I said earlier, I’m not trying to convert you into following a plant-based diet, I simply want to give you information so you can be as healthy as possible. True health in body, mind and spirit! 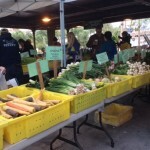 I pray you have access to an abundance of fresh vegetables daily. P.S. Be sure to look for some yummy recipes next week that will represent the rainbow! If you’re interested in learning more about phytonutrients and the food they’re in, check out this website, http://www.phytochemicals.info/phytochemicals.php. Phew! I’m exhausted just thinking about it! To make matters worse, if your kids are anything like mine, they’ve procrastinated and now have to cram months of work into two weeks. Oh yeah, that’s on top of any extra-curricular activities they’re involved in! As business manager, activities director, psychologist and leader in all things relating to health and wellness for our household, I’ve had to dry a few tears (not just my own), talk through some anxious feelings (“you’ll get through this”), help my kids make better food choices (fact: more social activities means more soda, candy and junk food) rearrange schedules (and not because of my basically non-existent social life) and stress the importance of getting a good night’s rest. With so much to do in such a short amount of time it’s no wonder we’re all stressed out! You may recall the post I wrote about anxiety back in November 2014, titled “Living with Anxiety”. In that post I shared how I cope with the levels of anxiety that surfaced after my husband, Larry, passed away. While the purpose of that post was to help adults cope with anxiety in their lives, I briefly mentioned how it affects children, as well. 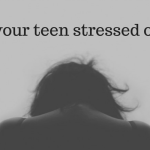 It’s a topic that’s gaining more recognition every day, and from what I see in my home and what I hear from other parents with adolescent children there’s no doubt about it: our children are stressed out. I know… You’re probably thinking we all have to face stress in our lives. But while that’s true, as a parent I want to know what I can do to help my kids cope with every day stress before it turns into an anxiety disorder. Having lived with anxiety myself, I know the lingering effects it can have on my overall mental and physical health. 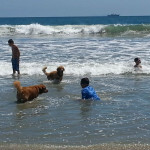 As a parent I’m always looking for tools and information to guide me in helping my children cope with daily stressors. Let’s face it: my children have already faced one of life’s biggest challenges when their father died. I’m fully aware that this life-changing event places them at a higher risk for developing an anxiety disorder. In addition, some children with special needs are also at a higher risk of developing anxiety disorders, so my son, Charlie, has to face an increased risk of developing an anxiety disorder not just once, but twice. Poor guy was dealt a double whammy at the tender age of seven. While I know I can’t protect my children 100% from any health issues, I can do the next best thing and give them tools so they can help themselves. According to the National Institute of Mental Health, 8% of teens ages 13-18 have an anxiety disorder (daily stress is not measured, but I can imagine it’s high). More disturbing is that symptoms commonly emerge around age 6 and, sadly, only 18% of the teens living with anxiety seek treatment. These are some scary statistics. That’s why this post is dedicated to empowering parents to help their children cope with every-day stress in order to help prevent it from turning into an anxiety disorder. For me, the first step is identifying possible sources of stress. * School demands and frustrations. * Problems with friends and/or peers at school. * Separation or divorce of parents. * Chronic illness or severe problems in the family. * Death of a loved one. * Moving or changing schools. * Taking on too many activities or having too high expectations. Well, I don’t know about you, but I can certainly identify with half of the sources listed as possible stressors not only for my kids, but also for myself! Yikes! Personally, I don’t recall having a lot of stress in my childhood. So… Why are our children more stressed than we were at their age? Some studies suggest increased expectations from school, increased use of electronics and decreased physical activity can play a role in our children having more stress than kids from previous generations. 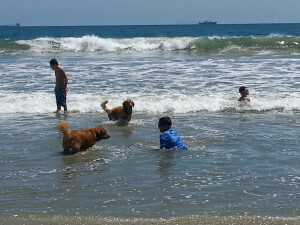 Once I’m armed with the knowledge of possible stressors I feel more capable in moving on to the next step: helping my boys to identify possible symptoms of stress. Helping your child isolate symptoms can help them understand their origin, that is, whether they’re from an illness or from stress. This is a wonderful tool that can be carried into adulthood. What are the symptoms of a stressed child? * Changes in behavior, such as being more irritable or moody. * Withdrawal from activities that used to give them pleasure. * Complaining more than usual about school. * Crying more than usual. * Sleeping too much or too little. * Abandoning friendships and/or isolating completely from parents. * Physical ailments not related to an illness, such as chronic headaches or stomach-aches. After Larry died, my son, George, complained almost every morning of a stomachache or headache. I told him that I believed his stomach or head hurt (mine did, too) but it was because of his grief and not a virus. He still had to attend school. His physical ailments lessened in time and with the benefit of grief therapy. Now George and I know that when he’s facing stress his common symptoms are headaches and stomach-aches. So when he feels these physical ailments and he isn’t sick, we know stress is probably a factor and this knowledge allows us to explore what may be causing it and practice some stress reducing techniques. My other children have their own set of recurring symptoms: when we recognize them we can pause and reflect on what the underlying issue may be and again, take action to eliminate the stress or find techniques to cope. What can a parent do to help their child decrease stress? * Feed them a well-balanced nutrient rich diet. 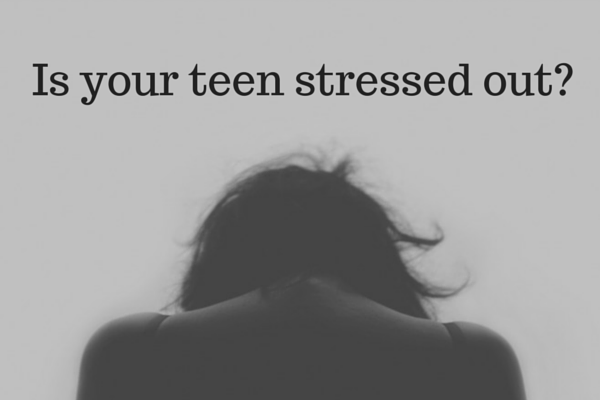 * Help your teen avoid excess caffeine intake, which can increase feelings of anxiety and agitation. * Talk to your son or daughter about the impact alcohol, drugs and tobacco can have with regards to increasing levels of stress. * The CDC states that sleep is essential for reducing stress and recommends teens get a minimum of nine hours. * Ensure they exercise on a regular basis. * Create chunks of designated “tech-free” time. * Practice relaxation techniques such as breathing exercises and meditation. * Encourage your children to take a “break” from what may be causing stress. If it’s schoolwork, urge them to close the books or turn off the computer and step away for a little while. If it’s relationship issues, persuade your child to stop texting or engaging in social media for a while. * If necessary, encourage your child to talk with a qualified adult, for example, a counselor at school, church, social worker, or professional therapist. As a parent, I want my child to talk to me, but I understand there may be times he may not want to. Therefore, I feel it’s more important that he knows there are other avenues available as opposed to shutting down and bottling up the stress. In addition to helping my children cope with stress as the school year wraps up over the next few weeks, I also need to maintain my practice of wellness techniques, which I’ve referred to in prior posts. I hope you do, too. I pray daily to have the guidance and tools to give to my children so they can be healthy in mind and body. And I pray ALL our kids can truly grasp that peace and happiness comes from within. Here’s to all of us finding happiness in our lives! P.S. You can read the post “Living with Anxiety” here and to get tips on creating affirmations read the post. “Affirming my Life!” here. There’s no making sense of the senseless. To say my boys and I are movie buffs is an understatement. Some of our family time is spent hanging out on Friday evenings, where you’ll find us making home-made pizzas (gluten-free, of course) and gathering to watch a movie. Of course, being teenage boys they like action movies, war movies and some psychological thrillers. Occasionally I can get them to watch a movie more geared toward my taste- but I’m used to having to compromise. I did when their dad was alive, because – not surprisingly- he chose the same genre of movies the boys like now! Going out to the movies is another family favorite and when “Fast & Furious 7” opened we couldn’t wait to go see it. While I had read in the newspaper reviews about the ending, I certainly didn’t think it would have the impact on me that it did. Who would’ve thought a fast-paced action movie could touch the very essence of my grief and leave me sitting in the theater, watching the credits, with tears streaming down my face? But that’s exactly what happened a few weeks ago. If you’re not familiar with the “Fast & Furious” series, it’s about illegal street racing, complicated heists, characters living large and many unbelievable stunts that get more daring with the each movie. There’s humor, suspense and good old-fashioned rooting for the good guys, even when the good guys are ex-convicts. Not exactly a recipe for a tear jerker! The final scene paid tribute to the late actor, Paul Walker, who was killed last year in a car accident. Filming of this movie was still taking place at the time of his death. As the final scene opened, the song “See You Again,” by Wiz Khalifa began to play. It starts with a beautiful melody played on the piano that filled the theater, followed by lyrics that sounded as if they were written for me and said exactly what I wish I could say to my husband, Larry, who passed away over four years ago. As soon as I heard the first line, the tears began to flow and spill down my cheeks. Even more touching was the sadness and pain reflected on the faces of all the actors in the last scene. Walker’s death was well publicized and some of the actors spoke about how much they would miss him. This all happened before the last scene was shot, so I knew the expressions on their faces weren’t faked: the pain I saw etched on their faces was real. And I know… Because it’s a pain you recognize and one you never forget. Yes, it’s been a loooooong day: over four years of long days, in fact. I still have my moments when I find it hard to believe it’s been over four years since Larry died. Four years that I’ve spent a majority of each waking day trying to make conscious choices to heal. Four years of taking a step forward, two steps back, and another forward. Four years of doing my best to raise three boys on my own. Four years that led me to the path I’m on, that of- sharing my grief with others. Yes, it’s been a long day without you, my friend. Why would a movie and tribute for someone I didn’t even know move me so much? Grief, you see, is a universal language. No words are needed to understand and feel compassion for those who also face grief. When grief comes into our lives it’s humbling; when we see grief enter into the lives of others it’s a reminder of our own struggles. Grief connects us all. So each time I’m confronted with the sudden and tragic death of another person (whether I knew them or not), all the feelings I felt immediately following Larry’s death come rushing back. It’s my belief there’s a natural order to life: we’re born, we have our childhood, we become adults, we raise families, we enter our golden years and, since none of us can escape death, we eventually pass on. Death- even at an older age- is very sad, but when it happens out of the “normal” order of life, it’s tragic. That’s how I feel about Larry’s death: it was a tragedy for him, and it’s still a tragedy for me and for our children. And that’s how I feel when I get the very sad news that another person has died unexpectedly: it’s tragic. While I’ve tried not to ask why, I’ll admit that in moments of despair I’ve wondered if there was a reason for Larry’s death. Some reason- any reason, really- that I would somehow be able to comprehend as long as I’m a mortal woman walking this earth. Will the answer ever be revealed to me, even after I’m dead and gone? After these difficult moments (and as you can see, I still have them), when the heavy cloud lifts and I can stand up and take another step forward, I take a minute and quietly remind myself that- Larry didn’t leave me on purpose, it was completely out of our hands. And, truth is, there’s no reason on this earth that can help take away the pain I feel knowing Larry died before he was able to guide our boys into adulthood. So no, there isn’t a reason good enough for me. Maybe that’s why the answer will never be revealed until my time has come. And I have to accept that during this lifetime I will never know why. The difficulty comes in being able to accept there’s no making sense of the senseless. So my advice is this: don’t bother. Don’t waste the energy you will certainly need to heal. In order for me to have all the energy that is required to move forward I must accept that I’ll never know the reason why my husband died too soon. I must also accept there’s only one life for me now, and sadly that doesn’t include him anymore- at least not on this earthly plane. And that’s when I turn to my faith. Faith that there is a heaven and Larry’s in it. Faith that one day I will see him again. And I also think about what I’ll tell him when I do finally see him again. Will I tell him it was too hard? That I couldn’t live my life without him in it because the pain was too great? Do I tell him I did the best I could? That every day was a different day… Some good days, some bad days, but I did the best I could. There’s another verse in the song I really liked, one that so eloquently states you should keep the faith. I will enjoy life and I will collect as many memories as I can. And, God willing, I will be allowed to live long enough to see my boys grow up and start their own families, if that’s what they choose. So while it has been a long four years without my love, I really do hope, for my children’s sake and my own, I get quite a few more. No matter what denomination you follow, I pray you will find the faith you need to live your life to the fullest, so when you meet the loved one who has gone before you, you can tell them all about it. P.S. In the photo above Larry and I are scuba diving in Hawaii. 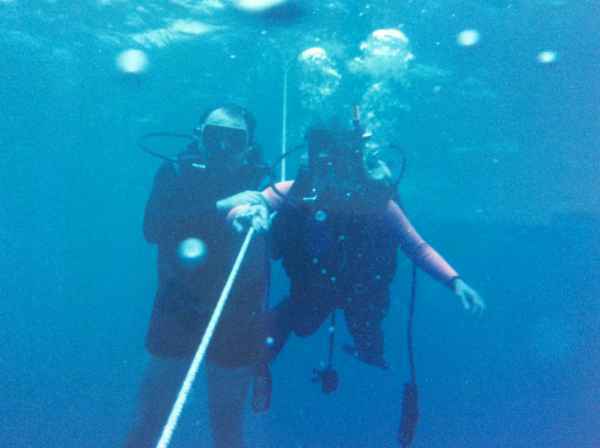 It was my first time and I panicked, went back to the surface and left Larry waiting for me until I could gain composure. After some time I decided to give it another try. Knowing Larry could do it gave me courage to give it another go… That, and I didn’t want to face his teasing if I didn’t go back down! He brought a lot of love and adventure into my life! I had so much information to post about allergies – and didn’t want to leave out anything important – that I decided to make it a two part post! 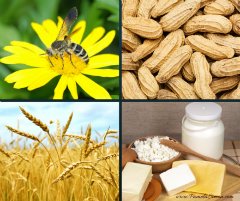 This first post will cover: a) why I believe this is such an important topic, b) describe what happens to the body during an allergic reaction, c) explain the difference between “allergy,” “intolerance” and “sensitivity,” and d) common symptoms of allergies and intolerances. In next week’s second part we’ll talk about: a) how to determine if you have an allergy or intolerance, b) the most common allergen foods, c) the “elimination diet” in detail, and d) the long-term effects on the body if intolerances are ignored. April seems the perfect time to discuss allergies. Spring is here and with it comes the usual onslaught for allergy sufferers. But while many people suffer from environmental allergies (grass, pollen, etc. ), more and more individuals are experiencing some form of reaction to the food they eat. 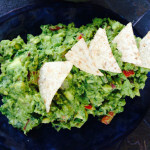 This can be a complicated subject because there are differences between “allergic reactions,” “intolerances” and “sensitivities.” In order to understand these differences we need to explore the various components that make up food – protein, fat and carbohydrates – and we need to understand how a person’s immune system responds in each circumstance. First, let me explain why I feel this is an important topic to explore, especially if you’ve experienced grief, a traumatic event, anxiety or depression. Basically, your body ends up working extra hard to compensate for the physical and mental strain that you’re going through, which means vitamins and minerals may not be utilized as efficiently as they did when you weren’t under stress. Your immune system then becomes compromised and you may not even be able to digest food in the same manner you did before you faced grief. If in addition, you’re suffering from a chronic illness or other immune disorder, again, your immune system will not functioning as it did before you got sick. The first spring after Larry died (2011) I suffered from multiple sinus infections, which led to many rounds of antibiotics. Eventually I had to take allergy medication daily to prevent more infections – all of which further compromised my immune system. 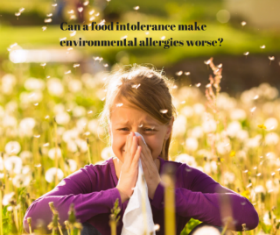 Another reason I want to explore allergies is that many children with special needs also have compromised immune systems and they, too, suffer from a variety of food intolerances. Five years ago a blood test revealed that my son, Charlie, was intolerant to wheat and dairy. So what does the immune system have to do with food allergies, intolerances and sensitivities? An allergy is a reaction by your immune system to a protein that it perceives as a threat. That protein can be found in food, pollen, dust mites, etc. Many people associate proteins with animal products such as meat, dairy or eggs, when in fact a majority of all foods (and plants) contain proteins. It’s this protein component that causes a reaction with our immune system. We’ve all heard about gluten intolerance: well, gluten is the “offending” protein found in wheat, oats, rye and some other grains. As I previously mentioned there’s a difference between “allergies,” “intolerances” and “sensitivities.” Each is measured when the body develops antibodies to fight the offending protein. These antibodies are also known as “immunoglobin” and in medical terms are called “Ig.” In an immediate allergic response, such as anaphylaxis, an “E” will follow the Ig response, reflected as IgE. If it’s a delayed response, as is the case with intolerances and sensitivities, a “G” will follow the Ig response, reflected as IgG. Remember: Whether you have an allergy or intolerance, your body is still building up antibodies! The former is immediately detrimental to your health, the latter can be just as detrimental, but takes longer to develop. While an immediate reaction can alert you to an allergy, it’s harder to determine if you have an intolerance or sensitivity because the reaction is delayed or minimal. In Charlie’s case he had severe constipation, stomach pains and eczema. When he was a toddler he used to wake up shortly before midnight, run out of his room screaming at the top of his lungs and sit on the floor holding his stomach. Larry was usually still awake and would run over and scoop him up to try to console him. Larry told me that the only thing that seemed to comfort Charlie was rubbing his stomach. Children with Down syndrome have a higher incidence of celiac disease than the general public. Knowing this – and based on his symptoms – I had Charlie tested for celiac, but the test came back negative. His pediatrician at the time explained that even though he didn’t have celiac he still might be experiencing intolerance to wheat. So I had more tests done. 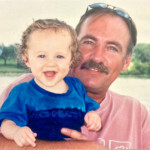 My naturopath doctor ran a complete panel of food intolerances/sensitivities: Charlie’s dairy intolerance was off the chart and his wheat intolerance was very high, but not off the chart, which explained why the celiac test came back negative. And then Larry got sick. Frankly, I had more on my plate with Larry’s illness than to worry about the food we ate. Then when he died I was more concerned about making sure my kids ate something rather than be concerned with the foods they were eating. I was doing the best I could, as I’m sure you are, too. But when I got sick it felt as though my body betrayed me. My joints and back were in severe pain from the inflammation and the exhaustion would hit periodically throughout the day, forcing me to lie down and rest. After months went by I started to feel a little better, but nowhere near how I felt before I contracted valley fever. Valley fever is a fungus that attacks your body and, there are no medications that will truly make it go away: antifungals help, but only to reduce the symptoms. As with a virus, you have to rely on your immune system to fight the fungus, and frankly mine was not very strong after all the grief I had experienced. But I wasn’t about to give up and live my life feeling “mediocre.” I wanted to do whatever was within my power to be as healthy as I could be. So the “type A” analytical researcher in me spent hours online, researching possible causes and remedies for inflammation. My heart kept sinking after each article I read. My children had already lost one parent; they didn’t need to lose another. I had to get my inflammation under control – and fast! That was two years ago. Who knew my quest to improve my health would lead me in such an amazing direction? 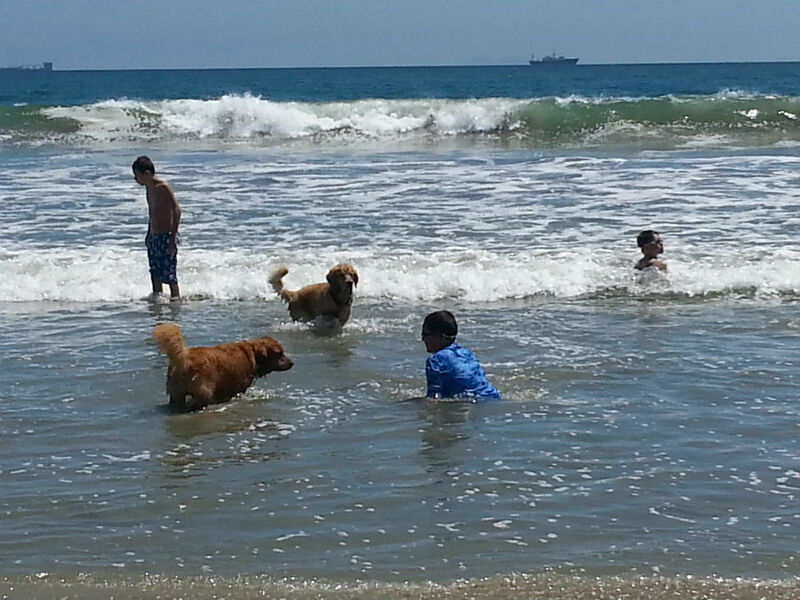 In fact, it’s made a huge impact not only on me, but also on the health of all three of my boys. Changing my diet and improving how I feel and live my life has given me better insight into how Charlie must have felt when he would wake up screaming in pain. Instead of feeling bad that he couldn’t have his goldfish and sourdough bread, I now feel worse that I kept feeding them to him! I’m a believer that things happen for a reason and I can’t help but feel that getting valley fever has set me on a path to help Charlie and others who face food intolerances. Until you walk in someone else’s shoes, you have no idea what he is experiencing. Next week I’ll explore testing methods, common allergens and what you can do to help yourself feel as good as possible. “It is health that is real wealth and not pieces of gold and silver.” – Mahatma Gandhi. Today I want to talk about two things: Hope and Love. Two small words with enough power behind them to lift my spirits when things go well or dash all my dreams when they don’t. Unfortunately when Larry died some of my dreams died with him. There were many dark days when I almost lost hope that I’d be able to have love and happiness in my life. Thankfully God gave me a child who has taught me over and over facing some of life’s biggest struggles, to never lose hope and never give up on love. I’ve written before that all of my children have provided me a sense of purpose to face each day. Yet, it’s been Charlie who has shown me over the years what perseverance can yield – hope and love. 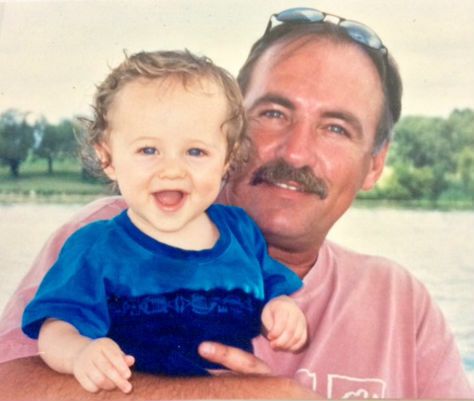 When I first learned that my son, Charlie, was born with Mosaic Down Syndrome, I experienced the many emotions that most parents do upon learning their child has a special need. I feared for his health, I was concerned about his future education and I was saddened that he would face struggles in life other children would never experience. When Charlie was an infant most of my concerns subsided as I watched him smile, laugh and sit up on his own like any other healthy baby. The enormous amount of love I had for him offered me hope that no matter what struggles he faced, I would be there to support him and I was determined that he would be given the same opportunity to learn that other children had. Little did I know then my hope for his future would be tested a handful of times since he was a baby. Nor did I realize at the time that Charlie would teach me more about life than I ever expected. Never, ever, ever give up hope. When Charlie was nine months old he started to exhibit behavior that made it appear as though he was having a seizure. From a sitting position he would bow at the waist, raise his arms, shake his upper torso and roll his eyes back. Like most modern parents we “Googled” his symptoms and found they matched something called West Syndrome. West Syndrome is a rare seizure disorder that usually appears in children 4–11 months of age. The prognosis is that 5% of children affected by this syndrome will die and 90% will experience severe physical and cognitive impairments. We visited a pediatric neurologist in Arizona to determine if this is what Charlie had. We brought videos of Charlie having a “seizure” and the doctor even witnessed Charlie having a couple of these “seizures” in his office. Our worst fears were confirmed when the doctor told us that based on the physical examination it appeared that Charlie did have West Syndrome. He went a step further and gave us anti-seizure medication and told us that as soon as he got the results of an electroencephalogram (EEG) he would call and give us the dosage. Once we confirmed the diagnosis through an EEG, it was imperative he take the anti-seizure medication as soon as possible. “No, no, no,” I thought to myself the whole way home, “this can’t be happening.” He was already diagnosed with Mosaic Down Syndrome – now this – how could so much happen to one little boy? After the first EEG the doctor called us with shocking news: there was no indication of a seizure in any of the brain activity measured during the test. Perplexed, he ordered another EEG, this time a full day exam that was to be recorded. This meant Charlie and I spent the whole day in the hospital with wires attached to his head and wrapped so he wouldn’t pull them off. Every time he physically appeared to have a seizure I was supposed to hit a key on the computer so the doctors could pinpoint the precise moment the “seizure” occurred. A few days later the doctor called. Again he was perplexed. Once more there was no activity in his brain to indicate a seizure. Basically he told us not to give Charlie the anti-seizure medication and all he could recommend at this point was to keep an eye on him. While I was relieved beyond belief that he didn’t have West Syndrome, I still wanted an explanation for the way his body convulsed continuously every day. I visited another pediatric neurologist, this one in Chicago, who confirmed Charlie was not having seizures and therefore didn’t have West Syndrome. But even he couldn’t give us an explanation for Charlie’s “seizures” except to say it had to be psychological. Which basically meant he was moving his body like that because it felt good to him! Hence we nicknamed him “Feel Good Charlie.” It would be a couple more years before we got a true diagnosis: Sensory Processing Disorder (SPD). SPD has been overlooked on many occasions mainly because it’s considered a secondary diagnosis and the symptoms can vary greatly from child to child. However, continuous education for parents, educators, therapists and doctors has been helpful in bringing much needed attention to SPD. Because there’s so much information specifically about SPD, I will try to cover as much as I can about it in another post. What I did learn from this experience was that no matter how certain or dire the situation may seem, never give up hope. Even in my grief I drew from this experience. There were many days when I thought to myself, “What’s the point?” or “Why bother?” And then I would remember each moment (and there were more like the story above) when I felt defeated facing the challenges I had with Charlie… and I would remind myself not to give up hope. I couldn’t give up on the hope that one day there would come a time when the intense grief I felt wouldn’t be all consuming. I couldn’t give up hope that one day my children and I would learn to function as a family without Larry. I couldn’t give up hope that one day both my children and I would feel peace and love when we remembered Larry, and not just the pain of his loss. No: I will never give up hope that the boys and I will continue to heal and live our lives to the best of our ability (because, in all honesty, one never completely heals from a loss this great). And I will never give up hope that Charlie will continue to surprise me and break through each ceiling and show others there truly are no limits to what he can do. Love is what brings people together. One of Charlie’s greatest characteristics is his ability to express pure love. It doesn’t matter if you’re a family member or friend, he’s filled with love and he wants to express it. In doing so, Charlie has brought many classrooms together. I will always remember the day his first grade teacher thanked me for allowing Charlie to be in her class! Just recently the mother of one of Charlie’s friends emailed me to tell me how much her daughter liked Charlie. I had tears in my eyes when I read this email. Unless you have a child with special needs, it’s hard to understand what it means to have this support and acknowledgment from friends saying they see the same beautiful qualities in your child that you do. It’s one more blessing I have to add to my growing list of gratitude. With all the lessons Charlie has taught me in such a short amount of time, I can’t help but believe God knew exactly what He was doing when He gave me my son. Charlie has brought me hope and love in moments when I was ready to give up. So the next time you see a family who has a child with special needs, respect they may have struggles (don’t we all), but there’s no need to pity them or feel bad for them, because they may be feeling truly blessed with the wonderful child bestowed upon them. I sure am. P.S. The picture of Charlie is from a recent trip to New York with his 6th grade class. He participated in the Montessori Model United Nations(MMUN) conference. 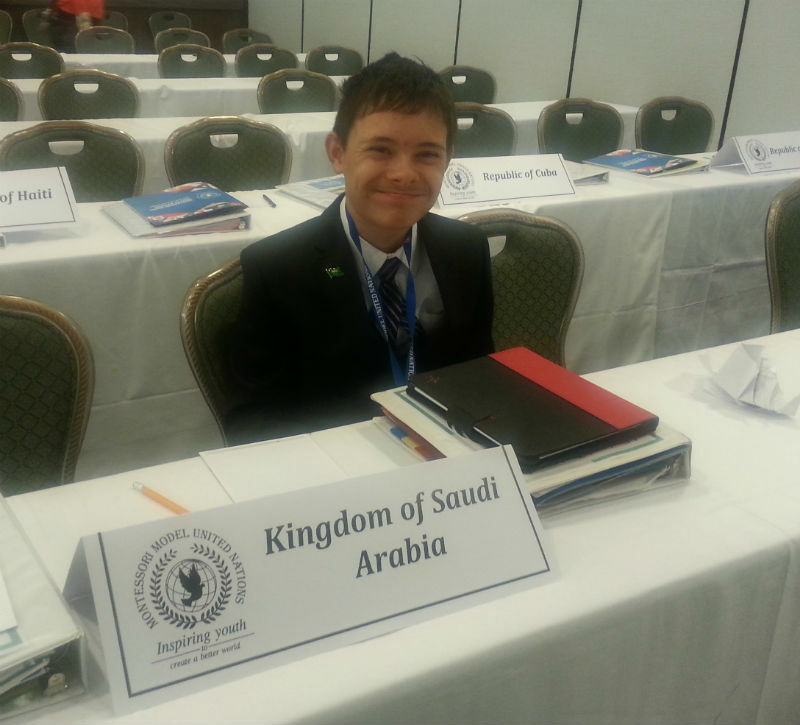 He was assigned a country, The Kingdom of Saudi Arabia, and an issue: The rights of a child. He did a fabulous job presenting his speech to the committee he was on, SOCHUM. 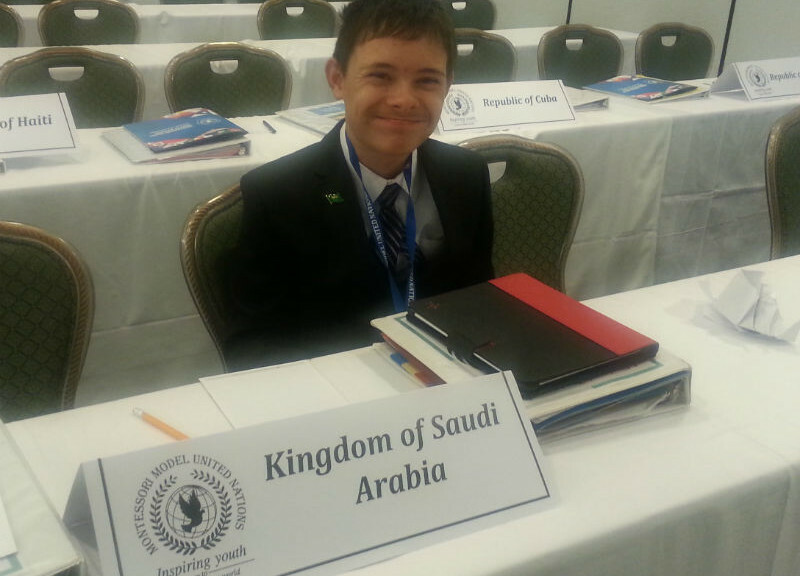 Who knows, he could be a future delegate fighting for the rights of children with special needs around the world!